Get some culture into ya! 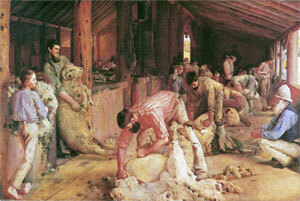 In the first installment of “Dinkum Aussie Art”, Kevin reveals to John the mysteries hidden within Australia’s most recognized painting, “Shearing the Rams” by Tom Roberts. John has his doubts. To make this episode extra special, we have also produced a video version for you to watch here on our site, or in the palm of your hand if you have a device so equipped. Enjoy! Hey guys, enjoying the podcasts. Practicing my ‘Stralian already for a move to Victoria next year. John seems to have his doubts about the Aussies’ artistic abilities in this week’s show – maybe while Kevin’s investigating visual art he could tackle other key areas of achievement in a follow-up podcast… I’d suggest starting with Classical Music (e.g. Kylie, Rolf Harris), or Drama and Theatre (“Neighbours”)! Keep up the good work on the show! This isn’t a forum; it’s a podcast blog with comments. We aren’t publishing any new episodes.